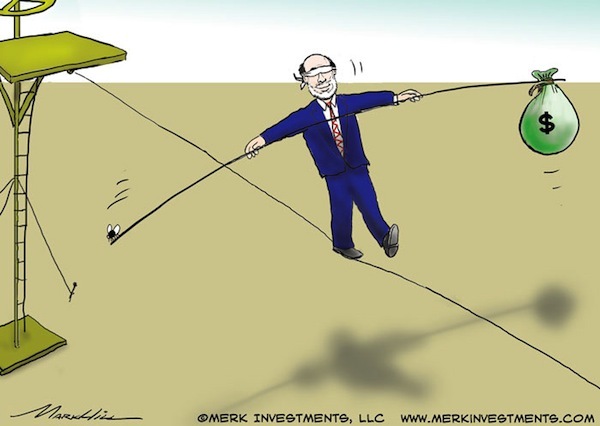 Merk Insights - U.S. to “Win” Currency Wars? U.S. to “Win” Currency Wars? Currency Wars will most importantly play out at the heart of investors’ portfolios rather than in the blogosphere or on TV. While the focus may currently be on Japan’s efforts to weaken the yen, U.S. investors might be particularly vulnerable. Let me explain. Currency Wars start at home because the value of the greenback relative to other currencies may be key to investors’ purchasing power. We know the Federal Reserve (Fed) has been busy buying Treasuries and Mortgage Backed Securities (MBS) through their Quantitative Easing (QE) programs. To pay for what is now a portfolio worth over $3 trillion in such securities, the Fed has deployed its “resources” – a fancy name for a computer keyboard, colloquially referred to as a printing press. Intentionally or not, the Fed has helped finance U.S. deficits as the more securities the Fed has purchased, the greater the interest it has earned, allowing it to most recently transfer close to $90 billion in annual “profits” to the Treasury. Of course much of that interest comes from Treasury securities held by the Fed, interest that is then transferred back to Treasury, effectively eliminating the interest the Treasury pays on the portion of outstanding debt held by the Fed (much of it higher yielding longer-term debt). Janet Yellen, current Fed Vice Chair and potential Bernanke successor, recently remarked in a February 11th presentation to the American Federation of Labor and Congress of Industrial Organizations (AFL-CIO) that the current (ultra accommodative) policy “is a policy that is not only good for output and employment and American workers, but also for the federal finances overall,” leaving the interpretation open that today’s policy is, at least in part, justifiable on the basis that it helps government finances. It is correct that the cost of borrowing for the U.S. has been declining and may continue to decline in the short-term as higher coupon paying debt matures and is refinanced at lower interest rates. However, in our analysis “Hidden Treasury Risks?”, we showed that the tailwind can easily turn into a substantial headwind. The Eurozone experience showed that the only language policy makers might be listening to is that of the bond market. That is, only when pressured by the bond market do policy makers engage in meaningful reform; the moment the pressure abates, the motivation to implement reform abates. 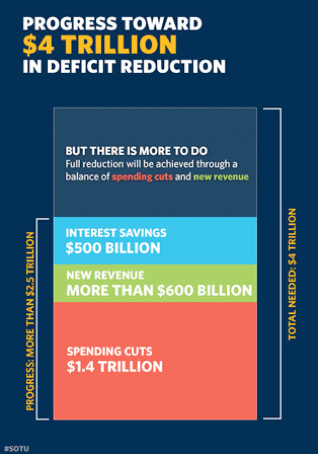 In my assessment, U.S. policy makers will only tackle entitlement reform, urgently necessary to make deficits sustainable, once pressured to do so by the bond market. Unlike the Eurozone, the U.S. has a large current account deficit. While the euro suffered at the peak of the crisis, the main risk in the Eurozone was breakup risk, causing those concerned to prefer German or Finnish euros over Italian or Spanish euros (in the form of buying their respective Treasuries). However, the Eurozone’s current account balance as a whole is roughly in balance, which means that net investment inflows from abroad are not necessary to sustain the value of the currency. Conversely, the U.S. requires foreign demand for U.S. dollar denominated assets to sustain the dollar’s exchange value. As such, should there be a selloff in the bond market to pressure policy makers to engage in reform, the U.S. dollar might be under far more pressure than the euro has ever been. Because of our current account deficit, the U.S. dollar may be vulnerable, from catalysts both inside and outside the U.S. This risk may be reduced, but not eliminated, should the U.S. indeed reach energy independence, i.e., cease to be a net importer of energy over time. While deficits attributable to energy imports and exports have historically been large, they only cover part of the overall trade deficit. What could trigger a selloff in the bond market? After all, ever since former Fed Chair Paul Volcker convinced the market the Fed is serious about inflation, owning Treasuries has generally been a winning proposition. Consider that the credit crisis was not triggered by a specific corporate failure (the Bear Stearns failure came only as the crisis had started), but simply by a return of risk (volatility) to the markets that forced levered players to de-lever. As an ever-increasing number of market participants de-levered, those that did not have liquid collateral had a problem. Similarly, while a surge in inflation expectations could unhinge the bond market, it may not be the obvious. Notably, we expect the biggest threat to the bond market may be economic growth. As we saw a year ago, good economic numbers can cause havoc to bond investors. In many ways, we have been lucky that all the money that has been “printed” hasn’t stuck. Initially, good economic data are likely to be touted as good news. Historically, however, in an economic recovery, the U.S. dollar tends to fall as the bond market turns into a bear market, causing foreign investors that hold large amounts of Treasuries, to stay on the sidelines. Staying on the sidelines is not good enough for the U.S. dollar that depends on billions in daily inflows to cover the current account deficit. We believe Currency Wars may hit the U.S. dollar particularly hard. There might be some good news: policy makers may be rather predictable, and indeed a weaker dollar may be exactly what U.S. policy makers want. As such, the risks may present opportunities. To learn how to navigate Currency Wars, please join us in our webinar this Thursday, February 21, 2013. Please also sign up for our newsletter to be informed as we discuss global dynamics and their impact on gold and currencies.